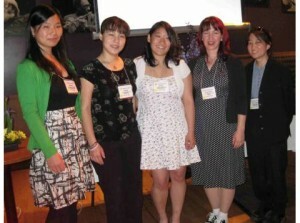 OAKLAND — The annual meeting of the Japanese American Women Alumnae of UC Berkeley (JAWAUCB) will be held Saturday, April 12, at Yoshi’s Jazz Club & Japanese Restaurant, 510 Embarcadero West at Oakland’s Jack London Square. Business meeting begins at 11 a.m., luncheon at 11:30 a.m. Program follows from12:30 to 3 p.m. The keynote speaker is Karen Tei Yamashita, professor of literature and co-director of the Creative Writing Program at UC Santa Cruz and award-winning author. She has been an active Kresge Fellow and student supporter, and received the Chancellor’s Award for Diversity at UCSC in 2009. Her acclaimed fifth novel, “I-Hotel,” was a 2010 National Book Award finalist and winner of the 2011 California Book Award in fiction. Her previous award-winning novels, “Through the Arc of the Rain Forest,” “Brazil Maru” and “Circle K Cycles,” are based on her sojourns in Brazil and Japan. Scholarship recipients at the 2010 JAWAUCB luncheon. From 1969 to 1994, Ishikawa taught in the Department of Architecture, where she also served as associate dean. Her outstanding career spans architecture, academia, public service and contributions to architectural theory. Her interest as an architect was specializing in people-space relationships at urban, as well as smaller scales, with a particular interest in affordable and low-income housing and community facilities. She is co-author of the seminal “A Pattern Language: Towns, Buildings, Construction,” which identifies qualities of “wholeness of place” as genuine determinants of people-based values. Election will be held on candidates for board of directors and officers. Volunteers are invited to serve on the board. California Alumni Association membership required. About five daytime meetings are held annually at a convenient central location. Board members attend from several Northern California communities. For a reservation form or more information, visit www.jawaucb.org/. I love University of California having been a student & lecturer. Like so many I am disappointed by Chancellor Birgeneau’s failure to arrest escalating costs/tuition. Birgeneau doubled instate tuition. On an all-in cost UC Berkeley is the most expensive public university; more expensive than Harvard, Yale. Tuition consumes more than 14% of a median family income. UC Berkeley ranked # 2 in faculty earning potential. Paying more is not a better university. Birgeneau dismissed: increasing the number of classes per faculty; eliminating courses with too few students; refraining from exorbitant salaries, bonuses; doubling the time between sabbaticals; freezing all vacant positions; freezing pay, benefits & reforming pensions, health costs. Birgeneau believes fiscal efficiency is not healthy for Cal. Exodus of faculty, chancellors, and administrators: who can afford them? An American Enterprise Institute study found that UC Berkeley can operate well on much leaner budgets. Californians agree it is far from the ideal situation.